Despite "all the odds stacking against" Edinburgh, head coach Richard Cockerill believes his side can beat Munster and reach the Champions Cup semi-finals. Edinburgh last reached the last four of Europe's top contest in 2012. And Cockerill says the hosts will have to be "right on our game" if they are to overcome the two-time champions. "Munster are a great side, they've got good players, they're well coached and they've got a good European history," Cockerill said. "But we've got good players and we've been on pretty good form in big games. We've qualified for the knockout stages three times in our history, this is their 18th. "All the odds stack against us but I think that suits us. For us it will be a good indication of where we are at and how we are learning to play as a team." 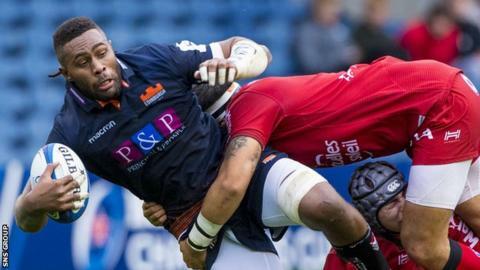 Edinburgh topped a group that included Montpellier, Toulon and Newcastle to set up a home tie, while Munster got the better of Exeter, Gloucester and Castres in their pool. Cockerill's side lost 44-14 away to Munster on Pro14 duty in November and were edged at Thomond Park in last season's play-offs. However, the hosts warmed up for this tie and breathed new life into their play-off hopes with a 28-11 win over Leinster at Murrayfield at the weekend. "Errors are big things in big games, small margins will be the things that make the difference," he said. "That missed tackle, that sloppy pass, that poor scrum or line-out, or that bit of brilliance in attack. "Munster will be favourites because of what they have done historically, but I think we've got to a point where every other team we play know if they are just a little bit off, we're good enough to beat them. "We're playing to win, it's not a consolation to get to a quarter-final and think, 'didn't we do well'. I want to be in a semi-final, the team wants to be in a semi-final, and I think we are capable of doing that."